The Grand Ole Opry is known around the world for creating one-of-a-kind entertainment experiences. Beginning as a simple radio broadcast and evolving into a live entertainment phenomenon, the Opry has not missed a Saturday night radio broadcast since 1925. For 90 years, the Opry has served as the center stage for country music's greatest artists, and has maintained a partnership with Shure, which also celebrates 90 years in 2015. With a multitude of performers each week, quick artist changeovers between commercial breaks, and nearly 180 shows a year, the Opry's monitor engineer Mark Thomas has no time for malfunctioning audio equipment. For its weekly radio and live broadcasts, the Opry has up to 14 acts per night, requiring reliable and flexible equipment. Thomas and his team have equipped the Opry with a lineup of Shure products and have looked to the company's wireless and in-ear systems for additional support during the broadcasts. Recently, the Opry installed Shure Axient Wireless Systems. 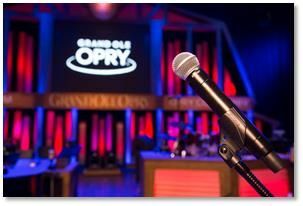 Given the Opry's lengthy broadcasts, the integration of Axient's rechargeable battery systems was an important factor in the decision to purchase the system, as the venue's microphones can be in use for up to eight hours. "It's no secret that the Opry is home to exceptional broadcasts and impressive audio performances," said Thomas. "All of this, combined with respected musical acts, has helped make the Opry experience a defining force for the past 90 years. "To deliver a great performance, you need even better audio gear and wireless systems. This is why we've always relied on Shure. The Axient wireless system with Wireless Workbench produces near-perfect RF performance, and is simple to use. Lengthy shows and artist changeovers create the need for a dependable battery system, as well. Axient's rechargeable battery was a big selling point for our team." The Opry also employs Shure's PSM 1000 Personal Monitoring System. "Just about every artist we've come in contact with at the Opry has experience with PSM 1000 and has confidence in using it," Thomas said. The Opry also uses a variety of Shure wired microphones, including the SM58. "Just like the Opry, Shure had a rich history of delivering on everything that it promised, from product quality to an exceptional user experience—two things we count on here at the Opry," added Thomas. "We're proud of our longstanding relationship with Shure and look forward to what the future holds for the both of us."